This is the most spectacular item from the hoard of eucharistic vessels found in a shallow hole at an ancient church site, Derrynaflan, in Co. Tipperary, in 1980. Although the chalice and strainer found with it are fine objects, the paten is of an altogether higher order. It tells us a great deal about the Irish elite of its time. The paten is a large, silver dish, with a diameter of approximately 37cm, probably intended to hold the sacred host during Mass. (It is unlikely to have been used regularly, and may have been intended purely as a votive offering.) As with the Ardagh chalice, the sheen of the silver sets off an extravagant, polychromatic display of ornament, set in twelve sections around the circumference and on the rim. Gold filigree and finely knitted wires of silver form dizzying patterns on panels studded with imitation gemstones made of cast glass and held in copper-alloy frames. Exquisitely traced golden men squat back to back in a tiny panel. Snakes, stags and eagles twist and rear in minute spaces. As with so much else from this zenith of early Irish art, the paten is a local response to a European model—in this case, Late Roman silver platters that were decorated with animals around the rim. This desire for a connection to the old Roman world is essentially aristocratic. The paten is also elitist in a theological sense: the images contain symbolic references to redemption, the Eucharist, baptism and beasts from the Book of Genesis and the psalms, but these symbols would be apparent only to the educated few. Which raises the question: for whom was this elite object made? Derrynaflan was patronised by Feldmid Mac Crimthainn. 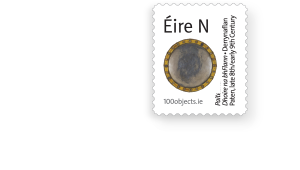 ‘The betting’, says Raghnall Ó Floinn of the National Museum, ‘is that he was the man who actually had the paten commissioned’. Feldmid, more than anyone else at this time, embodies the intertwining of religious and secular power. He was both king of Munster and a senior ecclesiastic. He claimed the high kingship of Ireland between 820 and 847 (although he never actually held it), while retaining his church offices, which came to include the abbotships of Cork and Clonfert. This was not unusual in contemporary Europe, but in Feidlimid’s case its contradictions were especially stark. Feldmid appears in the annals in different guises. His forces assaulted and burned the monasteries of Gallen and Fore in 822 and 830, respectively, and attacked Kildare in 836—all, presumably, to further his claim to the high kingship. Yet, he is also recorded as an ascetic anchorite, as a scribe and even, posthumously, as a saint. He was a terror, but, it seems, a holy terror. Feldmid’s aggression was evidence that a long peace between the major regional factions that dominated Irish politics—the Uí Néill overlords of Tara, the Éoganachta (Feldmid’s dynasty in Munster) and the Connachta in the west—was coming to an end even before external shocks began to have a profound effect. 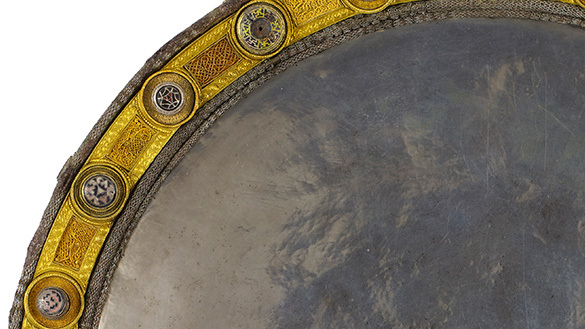 His possible role in commissioning the Derrynaflan paten is a reminder that these heavenly objects were not free from earthly connections.